Augusta is a city in the state of Georgia. As of 2000, the population was 195,182. In 1996, the governments of the City of Augusta and Richmond County combined to form the Augusta-Richmond County. The consolidated city-county is today simply known as "Augusta, Georgia". 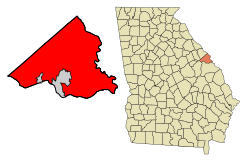 The area that makes up the city of Augusta includes almost all of Richmond County, except for the towns of Hephzibah and Blythe. These towns have their own governments separate from that of Augusta. Augusta is on the Georgia/South Carolina border. It is about 150 miles east of Atlanta. It is the second largest city and second largest metropolitan area in the state. Augusta is the birthplace of the Southern Baptist denomination. It is also the location of Springfield Baptist Church, the oldest African-American Baptist church in the United States. The city is famous for its golf course, the Augusta National Golf Club which is home to the first major golf tournament of each year, The Masters. This page was last changed on 25 June 2018, at 08:18.